Design is very important in our lives. If you looking at a buying strategy, we always look for a good design in clothes, furniture, mobile, footwear and even for homes we are looking to buy. According to Olga Stella, executive director of the Detroit Creative Corridor Center, "Design touches every aspect of our lives. From the way you interact with your phone to the clothes you wear to the way you pay your bills online, design creates solutions for all these things". Stella is part of the organizing committee which conducts Detroit Design Festival annually. This year it's all set to happen from Sep 21st - Sep 25th 2016. What can you expect during this festival? Fashion shows, design summits, art installations, wine strolls, film screenings, and live music into an event that serves as a spotlight on the design community. In 2015, the Detroit Design community was recognized by UNESCO and it was named as the City of Design. It's a big deal, since it's the first in the world. "We want to use the festival as a means to really get the conversation going about what design means to Detroit," Stella says. "We're having a summit where people can talk about what the UNESCO designation really means, and we're bringing in international speakers to talk about the change the designation has brought about in other cities." The five-day schedule includes smaller happenings like a screening of Parducci The Man Who Made Detroit Beautiful, a luncheon where residents can pitch in ideas on how to enhance the city through design, Metabolism II — an "exhibition utilizing performance, installation, sound, and video" — and an event where Wayne State welcomes people to "reimagine" Warren Avenue in Midtown. "This isn't an event for the Detroit Creative Corridor," Stella says. "It's truly a showcase of the Detroit design community." 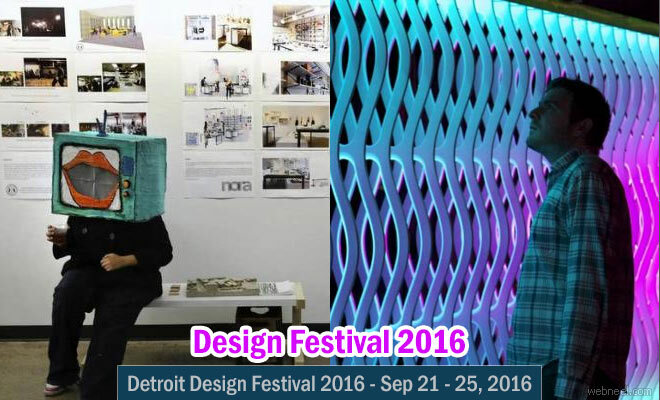 Gear up for Detroit Design Festival - 21 Sep 2016 Neel Design is very important in our lives. If you looking at a buying strategy, we always look for a good design in clothes, furniture, mobile, footwear and even for homes we are looking to buy.